Mark represents the Cascade Forest Conservancy’s by connecting directly with our local communities. As the Canvass Team Coordinator, Mark strengthens and expands the Conservancy’s base of donor support while working to recruit our next citizen volunteers interested in helping us conserve the forest. 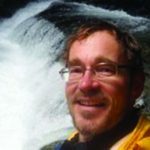 Originally from Wisconsin, Mark spent much of his time exploring the Milwaukee River and surfing the waters of Lake Michigan. He received his Bachelors of Science in Radio & Television Production from the University of Wisconsin-Oshkosh. Mark has been an outreach representative for the City of Portland Bureau of Environmental Services and Friends of Trees. When not representing the Task Force, Mark spends his time as an avid volunteer as a Master Recycler for the City of Portland and Metro, and as crew a leader on Friends of Trees planting events. Mark also enjoys hiking, biking and kayaking.